As we creep closer to War of the Spark, more and more planeswalker-adjacent cards gain attention. Deploy the Gatewatch was one of the first, and more recently, Oath of Teferi followed suit. I fully expect that we’ll see continued picking off of these types of cards leading up to the official spoilers, and once those begin, there will be an even greater movement across the market, as the level two players — people that watch the spoilers, but aren’t quite tuned in enough to see the writing on the wall before WotC makes it official — begin picking up assorted pieces. In the meantime, we’re spending more time browsing EDH, the format that keeps on giving. And let me tell you fellow friends, it doesn’t get much easier than this week. 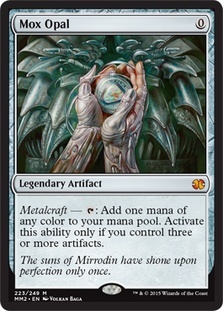 I’m starting with Mirrorpool this week, but all three cards on the list are basically the same deal. 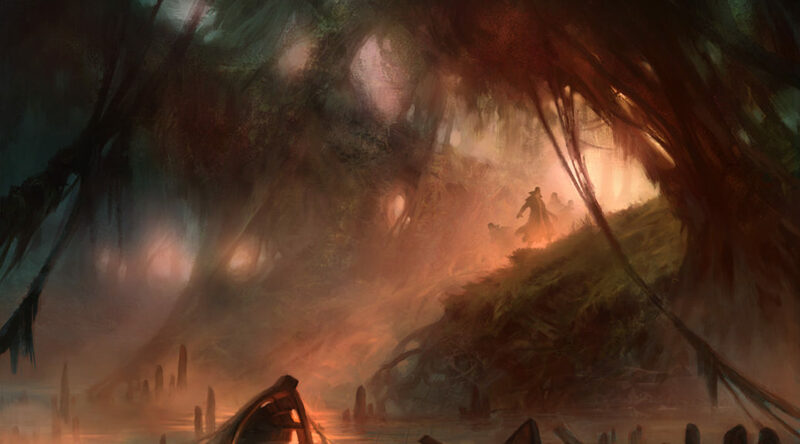 Each is a powerful land that slots into a wide variety of EDH decks. Each manages to pack a great deal of impact into a single land slot, which is especially valuable, as the spell package in any given deck is always tight. Mirrorpool is a one-shot Riku, for all purposes. It will double a single spell effect, or create a copy of a creature token. Casting a Time Stretch? You’re a monster, but you may as well lean into it and Mirrorpool it. Or maybe you’ll mirror the kicked Rite of Replication, or whatever the cool spell is these days at your local store. 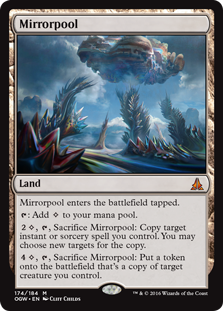 On the bottom half you can create copies of your own creature, for when you need another Diluvian Primordial (which will then cast your opponent’s Rite of Replication out of their graveyard, which you’ll use to target your Diluvian Primordial, which will then cast a Life from the Loam out of your opponent’s graveyard, returning your Mirrorpool to your hand, which…). At 6,200 EDH decks, Mirrorpool has a reasonable presence in the format. It’s not as high as it could be, but if it were 12k or 15k, the foils wouldn’t still be $7. What makes me so confident in telling you to check out Mirrorpool is the supply — 8 vendors of NM pack foils, for a combined total of 17 total copies. There’s roughly as many prerelease foils, which start about a dollar cheaper. Landing in twice as many decks as Mirrorpool is Alchemist’s Refuge, the — I guess it’s old, sheesh — flashland from Avacyn Restored. Somehow never having been reprinted, Refuge is intended to be a fixed Winding Canyons. (A card which is certainly not in enough EDH decks for its effect, at a relatively accessible $20, which leads me to believe it suffers from the Marton Stromgald problem, in that it’s an absurd card people simply don’t realize exist.) Giving all of your creatures flash lets you do some obnoxious stuff, whether it’s dropping answers to an invading force, tossing out a Sunblast Angel after attackers have been assigned, using one of a variety of creatures to cast the Time Stop in your hand at instant speed, or “only” dropping your threats for the turn at the end of turn of the opponent that acts before you, giving your bodies virtual haste, and not exposing them to sorceries for a turn rotation. Refuge has a potent effect that is found on one of the most resilient and difficult to answer card types in EDH. It slots into any deck with blue and green, the two most popular colors in EDH. And it comes into play untapped, making its inclusion a low opportunity cost. My only complaint is that its from Avacyn Restored, a set with notoriously bad foils. A tip on that — some foreign language AVR cards were printed with a different foiling process, making them preferable over English copies. There’s a grand total of 22 copies on TCG right now, with half of them in the hands of one vendor, and several well over $10. Shouldn’t be long before we’re looking at $20s on these bad boys. I’ve got a curious one to wrap up with this week. Sanitarium is in 11,500 decks, just short of Alchemist’s Refuge. Of course, it’s from Eldritch Moon, not Avacyn Restored, which means it’s four years newer. The text of the card is unassuming; each player draws and then discards a card. 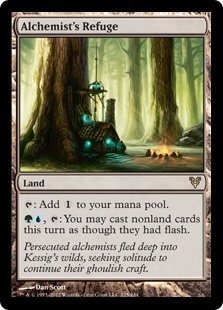 While that isn’t as immediately impactful as Mirrorpool or Alchemist’s Refuge, it’s phenomenal utility on a land. Repeated card draw that isn’t easy to target? Heck yes. 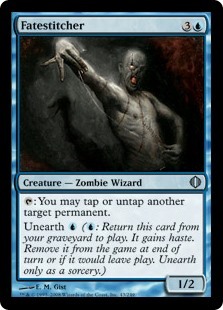 That you can untap with Seedborn Muse or Frantic Search? Heck yes. That lets you bin cards you want to reanimate or dredge or cast out of the graveyard? Heckin yes. Sanitarium has, as best as I can tell, a whopping ten copies on TCG right now, with a small smattering across other internet vendors. Here’s where it gets curious. The beginning of this month, prices jumped from $3.50 or so up to the $7 it will cost you to get in today. The market price hasn’t made it above $4 yet either. ABU, CFB, SCG — all basically empty, aside from a random $8 here or there. This smells like a buyout to me, and it hasn’t gotten anyone to take the bait yet. As much as I enjoy rambling about Modern and all the wild possibilities that the format is never kind enough to materialize, it’s not too exciting to look into at the moment. GP London saw Izzet Phoenix absolutely take over, with something like 23% of the field on day one. That’s an absolutely staggering percentage for a format like Modern, when 5% of a day is typically indicative of a tier one list. Pair that with Modern’s forthcoming upheaval (perhaps including Upheaval), which while exciting to consider, has rendered today’s Modern fairly meaningless. As Modern cards that I suspect will remain relevant cross my path, I’ll be sure to mention them, but for now, we’re keeping our sights on EDH. This is the third time the building our apartment is in has sold while we’ve been living here, so we didn’t think much of it when we received notice. We straightened out our security deposit on the new estoppel, signed the document, and got back to the standard tenor of our everyday lives. It was only when one of the business tenants of the building came to speak with us because they had learned that the new buyer had no intention of renewing anyone’s leases. Ours was the first on the chopping block, with an expiration date of August. Phone calls were placed, and the sum of it was resounding uncertainty. Left with no clear idea of whether we’d be allowed to live here past August, we had to reconsider our heretofore, uh, relaxed pace of home discovery. Faced with the possibility of needing to come up with a down payment a year earlier than expected, I took to my collection to see what I could begin liquidating. A box of Masterpieces found its way to the front of the line, and up a few went to test the waters. Within 48 hours the first sold; a Mana Crypt for $315. This recent sale was on my mind when I went exploring for this article, as it had been awhile since I had perused the Inventions from Kaladesh. That chunk of filler text aside, Rings of Brighthearth jumped out at me as one of the better positioned Inventions. Stock is low, perhaps the lowest of all the NM Inventions right now, with only 10 copies available for purchase at TCG (with zero left at SCG). Checkmark number one. Sorting the Inventions by most popular, you’ll find Brighthearth in sixth place. Checkmark number two. (Now, I take that to mean that Rings as a card is the sixth most popular within the list. Given that Cataclysmic Gearhulk is the second most popular, and there are 32 copies of the MPS left, I don’t believe it is looking specifically at the MPS copies.) Third, the pack foils of Rings have just about exceeded the Inventions copies. While the market price on those pack foils hasn’t caught up to the lowest listed price, that just means there’s a lot of attention on the card at the moment as it is. If people are buying out the pack foils and driving the price upwards of $100, what’s going to happen to the MPS copies? At a $100 buy-in, you’re looking for probably a $130 or $150 exit. If you’re lucky, you can find a copy floating somewhere under $100, at which point there’s some definite returns. Niv Mizzet has been enjoying some time in the sun over on EDHREC, which sent me perusing for anything worthwhile. It’s a lean build from our perspective, as there’s a lot of “dead” cards – Opt, Ponder, etc. Excellent for the build, terrible if you’re looking to make money. 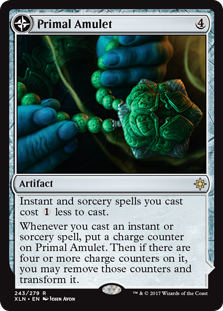 One card that’s not so poorly positioned though is Primal Amulet. 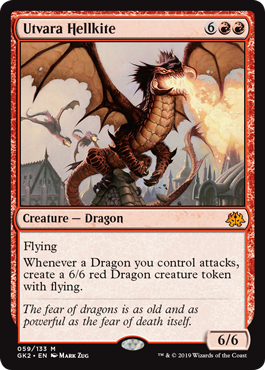 As an enabler, it’s obviously excellent in Niv Mizzet, as well as any EDH deck looking to cast spells. It’s also going to be a lot of fun at home, where cards like Cloud Key always entertain reasonable popularity. At 4300 decks, it hasn’t exactly exploded into EDH. At the same time, it’s from Ixalan, a relatively new set to EDH. It’s the sixth most popular from that set as it is, and the gap between it and the first card is reasonably narrow. Given that it’s about 2/3rds as popular as Growing Rites of Ixalan, a “fixed Gaea’s Cradle,” I’d consider it a well-positioned card. You’ll find a few pack foils hanging around at $5, though not too many. Prerelease foils are around $7 or $8, and the Buy-A-Box promos are $8 or $9. Pack foils at $5 are solid, though I certainly also like the BaB copies. If we see pack foils get to $15, BaB copies to $25 seems entirely plausible. At 8300 decks, Utvara Hellkite is solidly popular, if admittedly not an Eternal Witness. However, popularity within the tribe is remarkable here. Dragons are the second-most popular tribe in EDH according to the numbers, behind only Zombies. And within Dragons, Utvara Hellkite appears to be the single most popular card of the tribe. While the overall number of people playing Utvara Hellkite may be middle of the road, if you decide to play tribal, there’s a good chance it’s dragons, and if you’re playing dragons, you’re almost definitely playing Utvara Hellkite. And we both know Wizards isn’t going to stop supporting dragons any time soon. Two pieces of information are currently the catalysts of heavy market activity right now; the knowledge that War of the Spark is going to be heavily planeswalker focused, to the point that each pack is guaranteed a walker, and the existence of Modern Horizons, coupled with the point that no currently-Modern-legal card will appear in the set. Between them, every card that A. has to do with planeswalkers or B. exists in Modern is coming under intense scrutiny. We could talk awhile about the timing of the announcement — in fact, I did, on the latest episode of @mtgfastfinance — but that’s neither here nor there at the moment. We’ll keep our attention on the cards themselves this week. I’d also recommend revisiting last week’s article, specifically Mox Opal. I managed to find that card all over again this week, and it wasn’t until I pulled up my notes that I realized I wrote about it as recently as seven days ago. If it caught my attention twice in a row, I can at least say that my methodology is consistent, and I like the card. This isn’t a particularly clever pick, and there’s no doubt you’ve encountered other people talking about it as well. That alone makes it worth turning my attention to it, since we’re sort of one level above that here. Most content of this nature is “here’s what’s going to be good,” while I try to make this column more “here’s where the attention is going to be focused.” I’m not sure if I succeed at making that clear, or in doing it period, but at least I think about it while I’m writing. Anyways, Doubling Season. It’s hard to find a more well-known synergy than planeswalkers and Doubling Season. 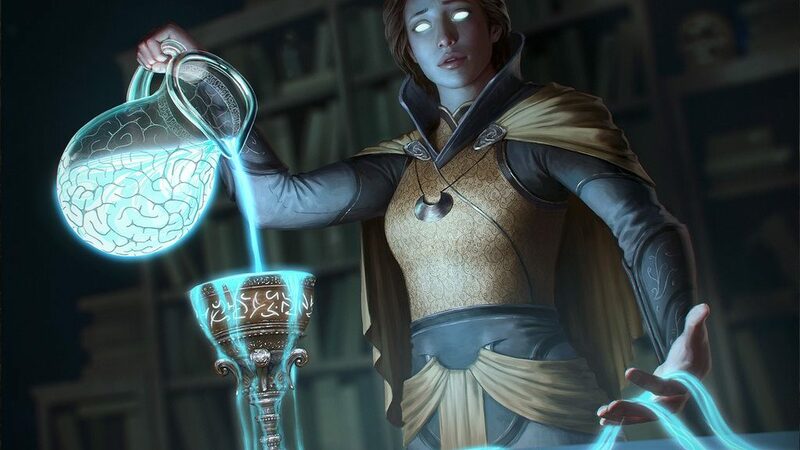 Season is the ur-EDH staple to begin with, and that particular interaction only intensifies the demand for the effect. You know this, I know this, every schmoe at your FNM knows this. It’s still true, and for that reason, worthy of our attention. 16,000 EDH decks can’t be wrong. With a deluge of planeswalkers a month away, expect there to be even more demand. What I especially like about non-foils is that Doubling Season is the type of card that speaks to the kitchen table. In fact, I myself bought a playset (for the hard decision of $20) back when I was playing living room table Magic. Those types of casual players don’t bother with foils at all. They’re also the type of player to be enamored with having “a planeswalker deck,” so the overlap is real. You’ll find copies in the $38 to $40 range. There’s maybe fiftyish copies under $45, and then they’re up into $50, $55, and $60. That’s about what we’re shooting for I think; $60. This isn’t a glamorous shot by any stretch. It’s safe though, as we know it’s not coming in Modern Horizons and is too expensive to end up in a Commander product. 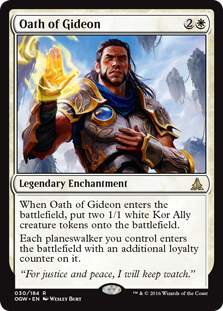 In keeping with our planeswalker focus, as that’s hitting shelves before Modern Horizons, we turn next to Oath of Gideon. 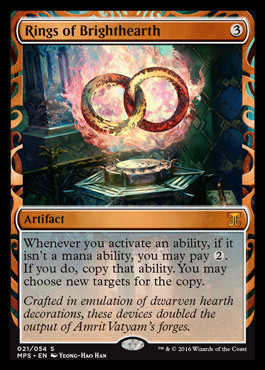 Two other Oaths are likely to be more directly impacted — Teferi’s and Nissa’s — as they’re, I guess, more “obvious.” Gideons is certainly useful though, as the two tokens run interference for a turn, and while a single extra loyalty isn’t as immediately impactful as doubling them, it comes down sooner, and is much less likely to be a target for enchantment hate while still shaving a solid turn off most ultimates. It will be hard to build any planeswalker-centric deck without Oath of Gideon, I suspect. The two tokens are valuable whether we’re talking a casual sixty card build or a full-sized EDH list. Given that it’s not the most popular card in EDH yet, and the relatively low supply, I’m wondering if this was already targeted. There’s a whopping 22 pack foil copies on TCG right now, and for a card that’s semi-new and not in 40,000 EDH decks, I’d expect much more than that. There’s no price changes in the card’s history, so if someone did go after it, they didn’t manage to impact pricing yet. Still, keep that in mind. What few copies remain are floating in the <$1 to $2 range. These should be an easy cruise up towards $5 or $6 once the spoilers are rolling in hard. I’d be looking for a quick exit on these, with the intention to buylist whatever you end up with. Rather than spend all week talking about WAR and the attention being paid to planeswalkers, I figure we should at least cover a little Modern. Remember, we want to look at cards that are currently legal in Modern that may see increased application or attention after having 250 new cards dumped into the set. My first choice for this slot this week was going to be Goryo’s Vengeance, until I remembered that it was in Ultimate Masters and that there were something like 400 copies of those on TCG right now. RIP Goryo’s Vengeance I guess. Elves is a tribe that’s always hung at the edges of Modern, trying valiantly to elbow it’s way into the crowd, even succeeding, rarely, at relevance, only to be tripped and trampled on by the larger decks wielding Anger of the Gods the following weekend. There’s never been the necessary component to give them full stability by means of enough power that it can overcome the minimal sideboard hate that typically wipes it back out. 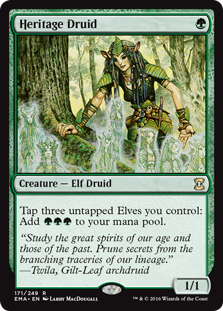 As a fan favorite tribe that’s on the cusp of playability, it’s not unbelievable that Wizards would toss “elf” on a key card or two in the interest of giving them a bit more depth and range. Birchlore Ranger has long been a card I’ve wondered about, as it would give the deck access to any color of mana it needed, opening up all sorts of slots, whether being able to side in Rest in Peace as a GB deck, or run Beck in the main without needing to ruin their manabase. Late this past week we got our first taste of Modern Horizons. 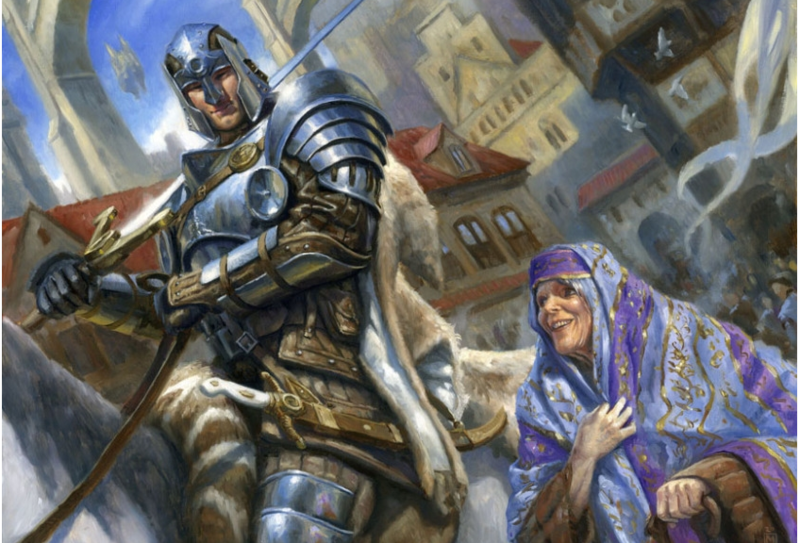 As far as card reveals went, one could apply the word “stingy.” Shown were Cabal Therapist, a card that undoubtedly tickled longtime Legacy players and Arrested Development fans, and Serra the Benevolent, a planeswalker card of Magic icon Serra. You know, from Serra Angel. (I’m admittedly underwhelmed by the card, but at the very least it invalidates the hell out of Worship. Which depicts Serra. Irony, or something.) Neither of these cards confirmed any mechanics, and at best told us two things: there may be a graveyard component to the set, and white has fliers. Difficult to make use of the insight that white will have creatures with flying. Rather, the truly useful information came in some of the other tidbits that were released. That tidbit is the fact that every single card in Horizons will be new to Modern. It’s the inverse of this that we’re working with; if every card is new to Modern, it means no cards existing in Modern will be in Horizons. Which means no reprints. No reprints of Modern-legal cards in a set likely to inspire more excitement in the format than Modern Masters. Hell, barely less excitement than the announcement of the format itself. Furthermore, this is taking up the summer slot, which means no Battlebond or Conspiracy style set to sneak a few reprints into. Taken collectively, this is making existing Modern cards look real appetizing. We’re starting with one of the biggest cards in the format, Mox Opal. 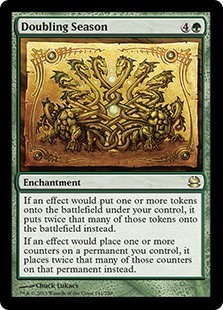 Is there a card that costs more than Opal in Modern? It looks like just Jace. Liliana is close, but not quite there. Opal is an expensive card. Relative to Legacy it’s peanuts, where several format staples will run you a grand a copy. Still, a tough nut to swallow for aspiring, uhh, modernistas. Well, I expect it to get worse. With no meaningful reprint venue this year, Opal is already ahead of the pack on dynamism. You’ll find it in both major flavors of affinity, Laternless, and a variety of other fringe strategies. No matter what Modern looks like, someone is going to be shoving a bunch of artifacts in their deck to take advantage of Opal. 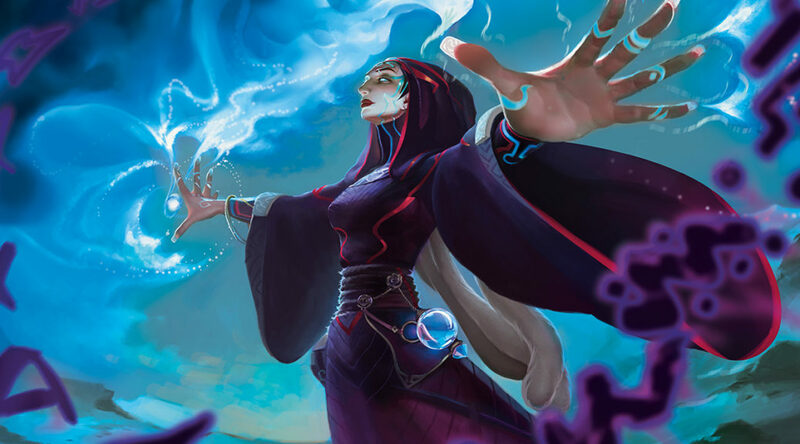 And now, as everyone gets excited about the format again, it’s likely there will refreshed enthusiasm for one of Modern’s most singularly powerful cards. Between Scars of Mirrodin and Modern Masters 2017 there’s not a deep supply, and even shallower under $90. You’ll find a few sets, maybe? Then a few more up to $100, and then assorted beyond that. Without additional supply — and where’s it coming from? — Opal is poised to hit $150 this year. 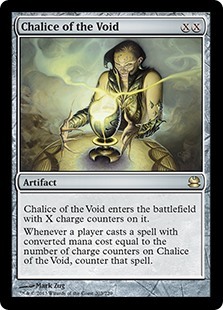 I especially like Chalice because it’s unlikely Horizons is going to slow down Modern. Why would it? If they printed 250 cards that were a turn and a half slower than the existing format, the format simply wouldn’t change. No, they’re giving us some juice, and unless this release is paired with a B&R update that takes fifteen cards out of the format, it’s only going to pull decks closer to the ground. Which is a disappointment, really. When Modern began you could attempt some truly ludicrous crap, and it was fine, because everyone was running around trying to win with Endless Whispers or whatever. Those decks were never good, mind you, but at least you could try them and they didn’t seem so offensively bad that you felt the need to use anime sleeves just to draw attention to an even greater atrocity in an attempt to distract from the fact that you were playing a veritable pile. Now, casting a spell that costs three is dangerous. I miss the loose, anything-goes sensation of Modern. I guess I’m just waiting for NuModern at this point. Anyways, Chalice. Supply is healthy, with printings in Mirrodin, Modern Masters, and Masters 25. We don’t need to drain the supply in order for prices to move though. Once a few sets at $40 start selling it’s likely vendors will begin raising prices. I’ll go a slightly different direction for my last card this week. In 14th place of a recent MTGO Modern event was a Jeskai Ascendancy build that utilized, what else, Arclight Phoenix. This build appears to be less all-in than the old builds, which sought to power up a lethal Grapeshot. This build instead utilizes Phoenixes and a few Young Pyromancers to take advantage of a smaller number of Ascendancy triggers, maybe five, to quickly ramp to lethal. I’m amused, and it would be cool to see this become more than a one-event deck. Those of you that have been around a few years will recognize the name Fatestitcher, and will likely recall Glittering Wish as well. Back when Ascendancy was printed this deck exploded into Modern, with turn two kills theoretically possible. (Back then it played Noble Hierarch to set up a turn three Ascendancy, which could then be activated with the then-legal Gitaxian Probe, which untapped your Hierarch, at which point you went ham. Cool deck.) Fatestitcher got caught up and moved a bunch of copies, and has since trickled back into the market as Ascendancy mostly disappeared. This recent success opens the door to a return of Fatestitcher, and let me tell you, available supply will not support a surge here. There’s maybe 20 playsets on the open market? At $2, this will absolutely disappear if the greater community gets a whiff of it being good. Remember, Fatestitcher has one single printing, which makes it somewhat of a rarity in today’s Magic. Should this deck catch on — which I am by no means implying it will — these will be gone in minutes.